Hexlord Raal: Let me guess, Loti had ya killin’ any trolls dat smelled of blood magic ya? Well that is barely a half measure. See, blood magic be da old ways, and our people only be givin’ in to its allure since the walls fell on our northern border. Come, we gonna go for a little ride and patrol the border to Nazmir. Dat where all dese bad ideas be comin’ from. Patrol the skies with Hexlord Raal. NOTE: Walk behind Hexlord Raal toward the edge. Click Ata the Winglord to start flying the skies. The goal is to click the Farseer Totem on the circles found on the ground (press 1 in your keyboard). Hexlord Raal: I’ll call out de best spots, and ya can have the honors of tossin’ down a sentry totem. Hexlord Raal: A few years back, dis whole land shook during da Cataclysm. Our northern gates fell, and swarms of blood troll savages poured through. Hexlord Raal: Dat’s when we got our first taste of real blood magic. Not dat petty stuff the lesser tribes do. Hexlord Raal: Our defenses grow weakah. Princess Talanji been asking for more troops. When her father did not act fast enough, she turned to de Horde. 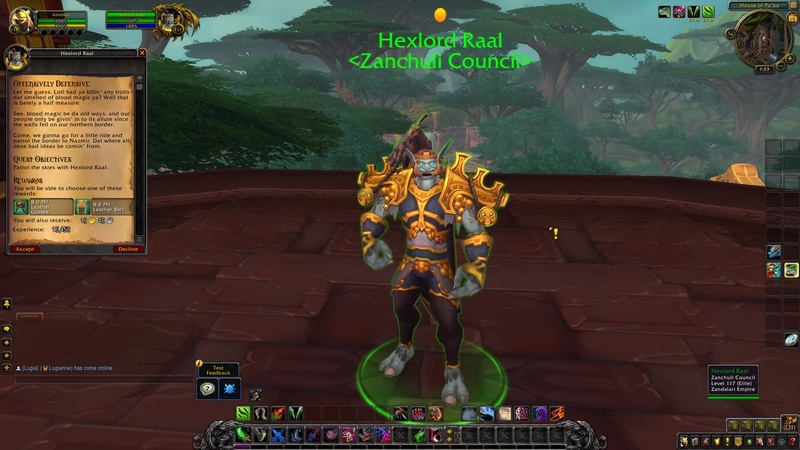 Hexlord Raal: Not a week goes by dat we don’t see some Zandalari turnin’ to blood magics learned from dose heretics of Nazmir. Hexlord Raal: Hmm, sometin’ not right. I sense a powerful source coming from INSIDE Zanchul. Hexlord Raal: Droppin’ you off with Loti. Let her know da source of all dis might be within Zanchul itself. Wardruid Loti: Oh, so dat bent-tusk nose-breather be tryin’ to win ya over wit’ a little flight an’ some charm, eh? 43. Unlikely Allies 46. Push Them Back! 53. To Gloom Hollow 58. 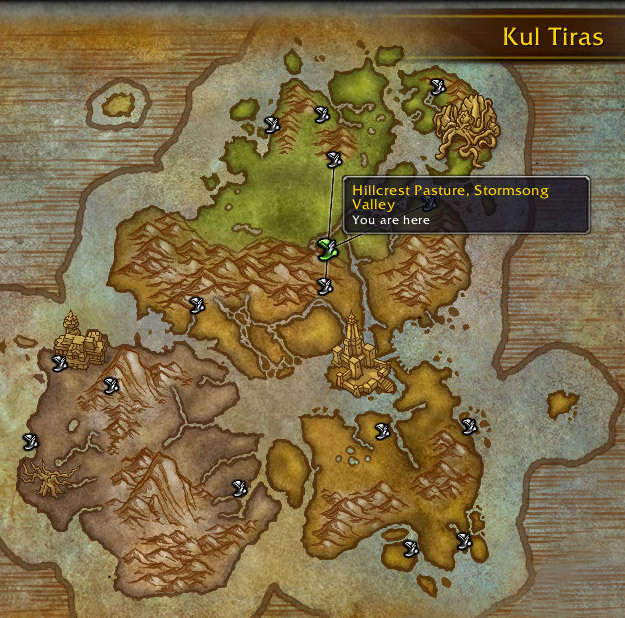 There Is No Plan "B"
The War Campaign takes you to set a foothold on the Alliance land of Kul Tiras. 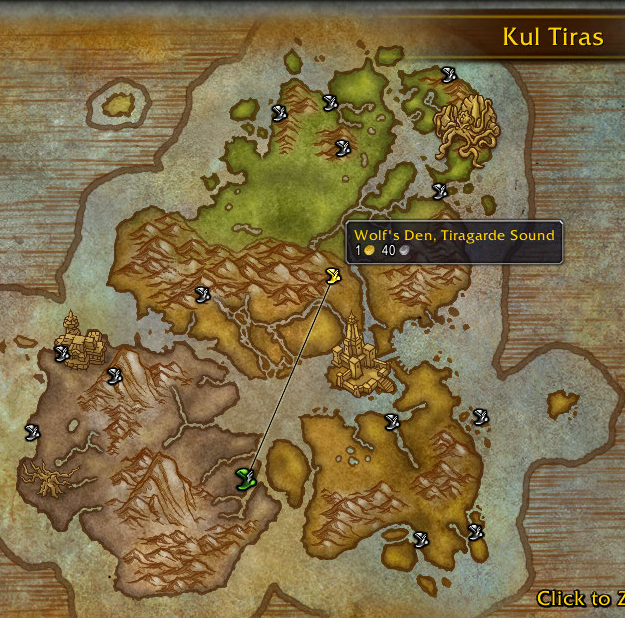 At the beginning, you can choose one of three foothold destinations: Tiragarde Sound, Drustvar, or Stormsong Valley. The first foothold choice of the War Campaign starts at level 112. Second foothold unlocks at level 114. Island Expedition unlocks at level 116. The Third foothold unlocks at level 118. Unlocking all three Footholds unlocks access to World Quests & the Flight Master's Whistle reward. 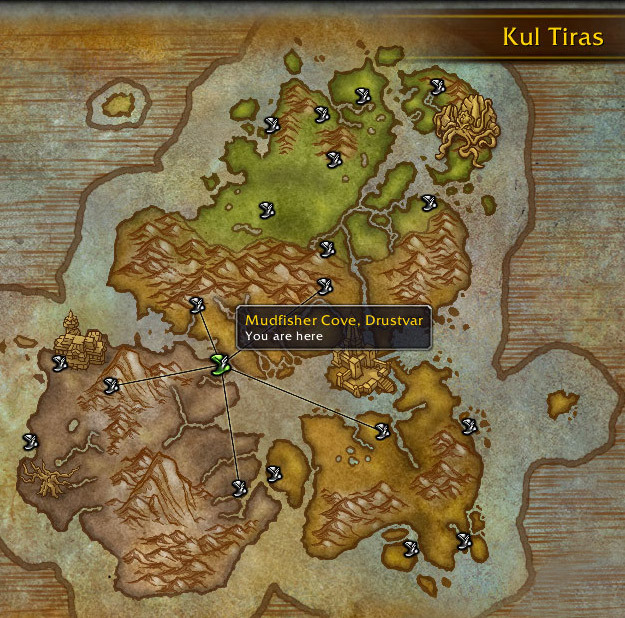 Talk to the Honorbound emissary Ransa Greyfeather (58.01 62.63 in Port of Zandalar). 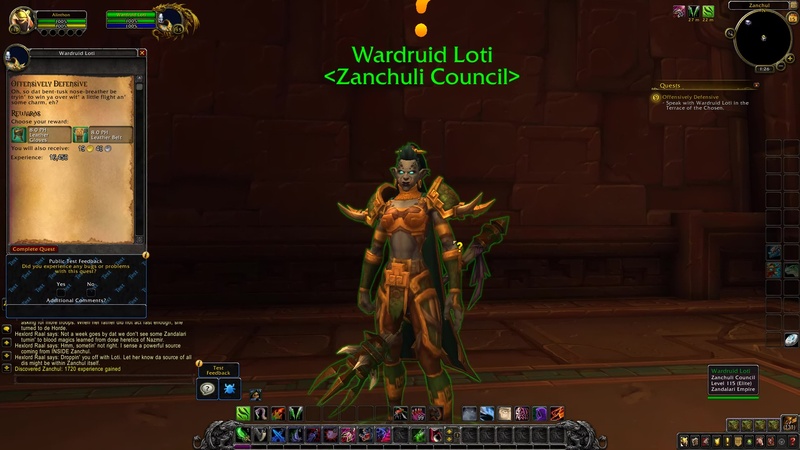 You unlock new flightpaths by purchasing the mission table quests from her. Open your inventory bag. Click the item to consume it. Nothing happens onscreen. Simply go straight to your Mission Table. The quest is now available there. Send Followers to complete the Mission Table quest. This quest pops onscreen below the mini-map when you reach 3000 Honored reputation with the Honorbound. 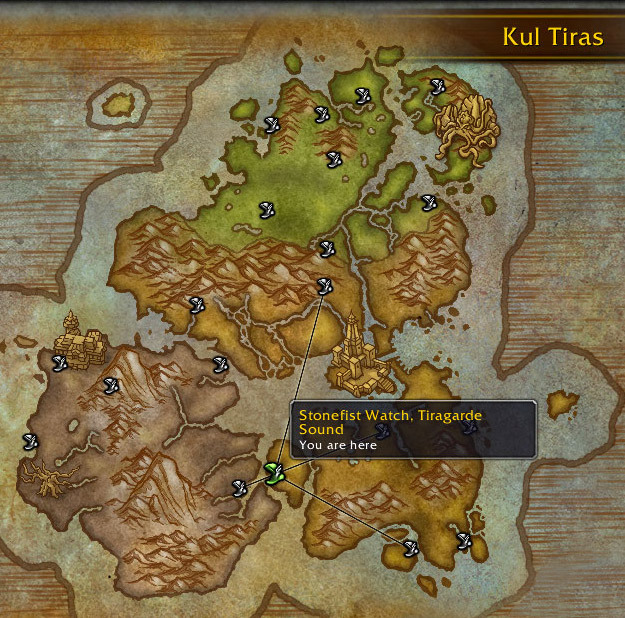 This quest pops onscreen below the mini-map when you reach 7500 Honored reputation with the Honorbound. 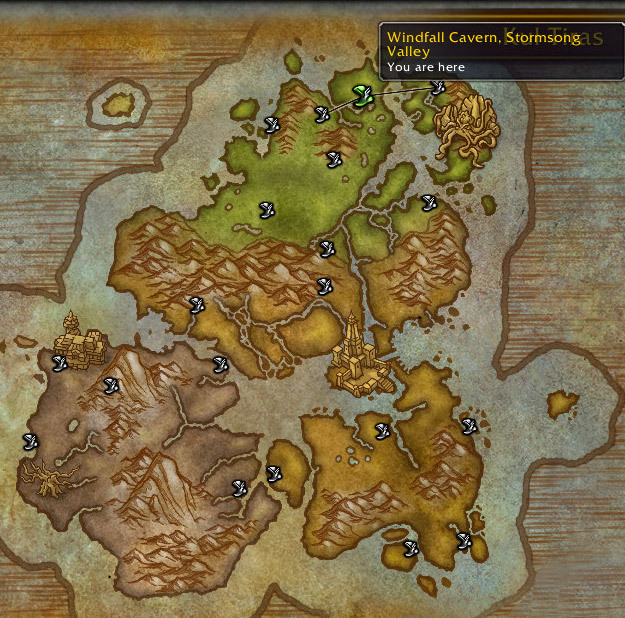 This quest pops onscreen below the mini-map when you reach Revered reputation with the Honorbound. 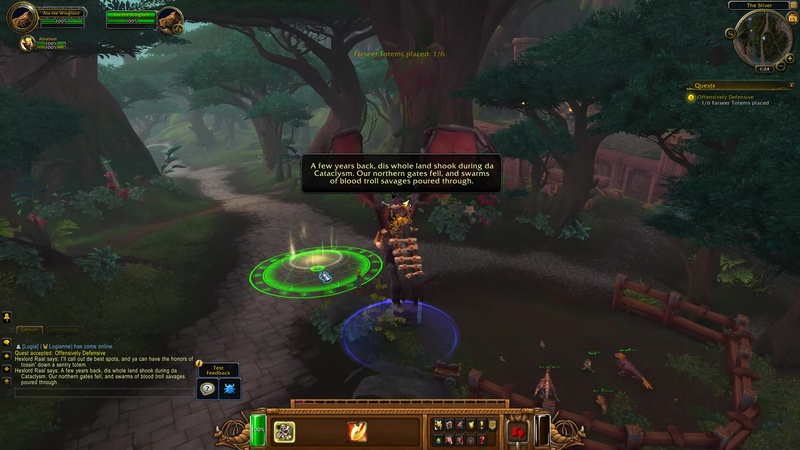 Completing the entire questline grants the Ready for War achievement. 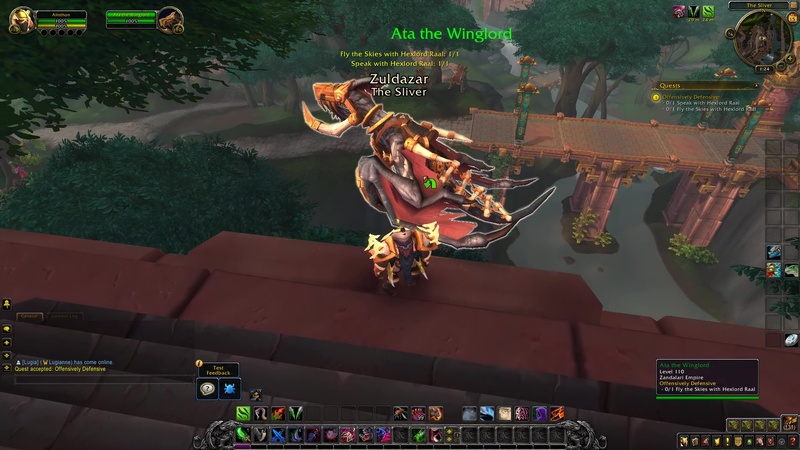 This achievement is a requirement of the Battle for Azeroth Pathfinder (Part 1) achievement to unlock faster mount speed in Kul Tiras and Zandalar. 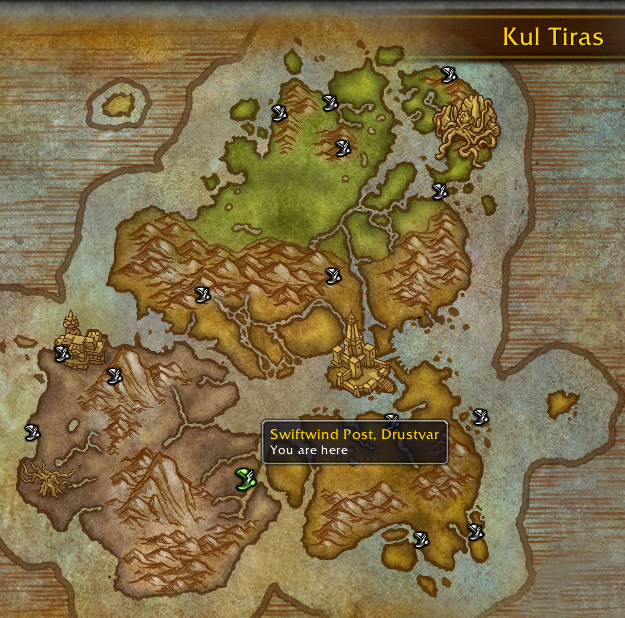 Post-Revered or Exalted with the Honorbound, you can upgrade Zandalar outposts. Hope you enjoyed this article. 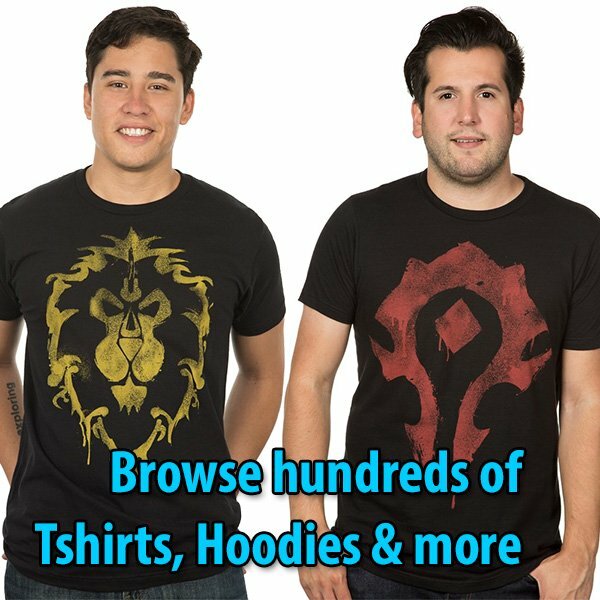 Please, support Blizzplanet on Patreon, and follow us on Twitter, Facebook, YouTube, and Twitch for daily Blizzard games news updates. ***Fans who would love to watch Blizzard-related panels and appreciate our efforts can support Blizzplanet’s patreon in a monthly-basis, or a one-time basis. Our staff are volunteer fans like you. Your donations will help us travel to all the Blizzard events we attend year-round to bring you the latest interview with the developers, photos, and panel videos (where allowed).